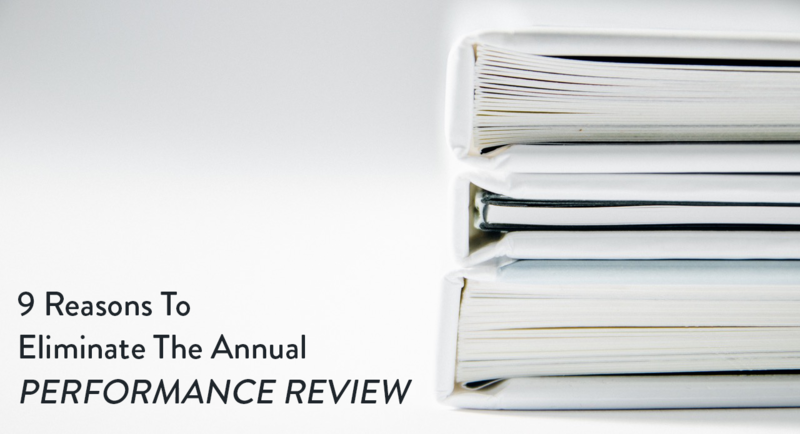 Are you considering finding a replacement for the traditional annual performance review? If so, you’ll be in good company. Accenture, Deloitte, Microsoft and General Electric are just four of the many US companies that have done away with the annual performance review. So, what’s wrong with the annual performance review? 1. Why wait a full year? If you make employee performance reviews a recurring process, with frequent manager/employee interactions, you eliminate the “recency effect” where only the past month’s performance is evaluated and an entire 11 months of work is overlooked. Managers should provide feedback after each project. That way the employee knows that work is being recognized and understands areas that need improvement. 2. It focuses on the past instead of the present. An annual performance review looks at how an employee has performed in the past, rather than what he or she is currently doing. A better model would focus on current performance with a quick overview of past successes. Frequent assessment and feedback from managers builds a better picture of each employee and their impact on your small business. The traditional annual performance review costs $3,500 per employee. This cost includes the 210 hours each manager spends on meetings, discussions and other activities relating to performance reviews. Frequent feedback meetings will inevitably be shorter, and each one is less comprehensive, so less preparation time is required. Only 27% of HR professionals think an annual performance review improves employees’ skills, knowledge, and abilities. Put that another way; 73% believe they are a waste of time and resources. Ask your HR department to come up with a better way of working, perhaps focusing on identifying areas where employees would benefit from training. 5. It usually only includes one person’s opinion. Managers are rarely trained in the skills necessary to conduct a successful annual review. Most managers have been hired for their knowledge and expertise in particular areas, rather than their skills such as the ability to give critical feedback in a constructive manner. This results in widely differing standards and is a weakness that is inherent in the current system. An employee’s review depends on the opinions of one manager. Train your managers to be objective and to recognize any biases they may have. If you perceive a pattern of complaints about one manager, they should be addressed swiftly and productively. 6. Ranking employees is demotivating. Most HR managers believe forced ranking systems, especially those where the bottom 10% are fired, lead to conflict in the workplace. In companies where this type of annual performance review exists, employees are competing against each other and credit for ideas and progress is stolen. Categorizing employees into different groups can be demoralizing and alienating. Use an appraisal system that is more focused on helping people to overcome their difficulties and to become more valuable team members rather than calling out their inefficiencies. 7. It causes exceptional employees to be undervalued. Outstanding employees think outside the box. Their thinking is not limited by their job descriptions, nor by the format of an annual review. Their contribution to the company is rarely recognized by a standardized performance review. Stellar employees lose out if they fail to fit the mold that HR reviews attempt to force them into. Do you really want to fire employees who think creatively simply because they don’t fit into the typical mold? Ask managers to identify exceptional employees and set up a parallel appraisal system that recognizes the significant contributions these people make. 8. It puts disproportionate value on measurable performance. Employees contribute to your company’s success in many ways that are immeasurable. Not every employee’s role can be assessed in numbers achieved, pallets shifted or new customers obtained. These immeasurable functions can include tasks such as training other staff, preparing white papers or researching competitors. All of these are essential to your company’s health but can’t necessarily be measured with traditional methods. Identify roles where performance can be substantial without being measurable. Ensure your new performance review system takes account of this group of employees. Employees find the traditional performance review very stressful because they know their job is being scrutinized and potentially at risk. Their fear restricts creativity as employees focus on the aspects they know will be covered in their performance review interview. Shifting the emphasis from a ranking system to one of individual development will remove much of the fear employees have. Creating frequent informal feedback opportunities will also help.